NEW YORK – Although it falls on a Wednesday this year, AAA projects nearly 47 million Americans will travel somewhere for the holiday. If this forecast comes true, it will set a new travel record. Unfortunately, it’s also one of the most dangerous holidays to be on the road. According to our accident attorneys, New York State Troopers will respond to hundreds of accidents over the holiday week. Not all holiday-related accidents are related to motor vehicles, so our Brooklyn personal injury lawyers have laid out a number of common injury-causing accidents that are common around the Fourth of July, and what you can do if you’re a victim. All of these occur more often during holiday weekends. If you’ve been injured in a car accident, our Brooklyn car accident lawyers urge you to first seek medical attention, never admit fault, and contact us as soon as possible. Even if you’re not sure if you have a case, our experienced legal team can help point you in the right direction for help. What’s a Fourth of July holiday without fireworks? That would be a shame. Our Brooklyn accident attorneys want you to have fun over the holiday – but please, do it safely! 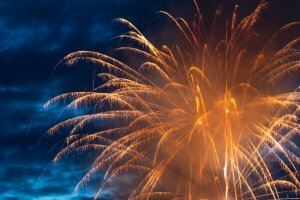 Every year, we see news stories about someone who has seriously been injured by fireworks. Many of these cases boil down to improper usage of fireworks, but sometimes bystanders can get seriously hurt. Whether you were at a fireworks show or at someone else’s home, the property owner has a responsibility to keep everyone safe from harm. Too often, things get wild – and dangerous! If you’ve been injured in a fireworks accident, the first thing you need to do is get medical attention. Once you’ve seen a doctor, give our team a call. Our accident attorneys have years of experience helping New Yorkers get compensation which can help pay for medical bills, rehabilitation costs, and lost wages resulting from a fireworks accident. According to our accident attorneys, New York hosts dozens of carnivals each summer, and accidents have happened at almost every single one of them. Many of these accidents are minor and go unreported, but there are a few that seriously injure carnival-goers. If you or a loved one has been hurt on a roller coaster or a carnival ride, get immediate medical attention. Statistics have shown that recovery times can be drastically reduced if injuries are addressed as soon as possible. After you’ve visited the hospital, give Cellino & Barnes a call. We have Brooklyn roller coaster accident lawyers who have won substantial settlements and verdicts for many carnival ride victims. One way to beat the heat this summer is a trip to the public pool. We’ve all seen the pool rules posted, and it’s important to adhere to these rules for your own safety. It’s equally important to have a vigilant lifeguard on duty because accidents do happen. If you or a family member has been injured in a swimming or slip and fall accident at a local pool, give our experienced team a call. You might be surprised at what Cellino & Barnes could do for you and your family. Have a Happy and Safe Fourth of July!